318 pages | 7 B/W Illus. This accessible textbook gives students the tools they need to analyze games using strategies borrowed from textual analysis. As the field of game studies grows, videogame writing is evolving from the mere evaluation of gameplay, graphics, sound, and replayablity, to more reflective writing that manages to convey the complexity of a game and the way it is played in a cultural context. 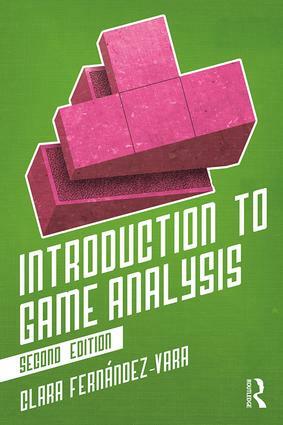 Clara Fernández-Vara’s concise primer provides readers with instruction on the basic building blocks of game analysis—examination of context, content and reception, and formal qualities—as well as the vocabulary necessary for talking about videogames' distinguishing characteristics. Examples are drawn from a range of games, both digital and non-digital—from Portal and World of Warcraft to Monopoly—and the book provides a variety of exercises and sample analyses, as well as a comprehensive ludography and glossary. In this second edition of the popular textbook, Fernández-Vara brings the book firmly up-to-date, pulling in fresh examples from ground-breaking new works in this dynamic field. Introduction to Game Analysis remains a unique practical tool for students who want to become more fluent writers and critics not only of videogames, but also of digital media overall. Clara Fernández-Vara is Associate Arts Professor at the NYU Game Center, New York University. She teaches courses on game studies and narrative design, and works as a freelance game designer and writer. As a researcher, her main interest is in exploring the integration of stories and gameplay, as well as developing theoretical frameworks to understand games better.